A newspaper article about how Oviedo, Florida, got its name. According to the article, the town was named by Andrew Aulin, Sr. (1843-1918), a Swedish immigrant and Oviedo's first postmaster. 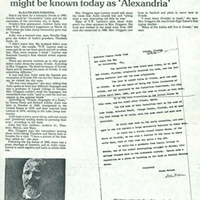 W. E. Alexander had suggested Alexandria as an alternative. 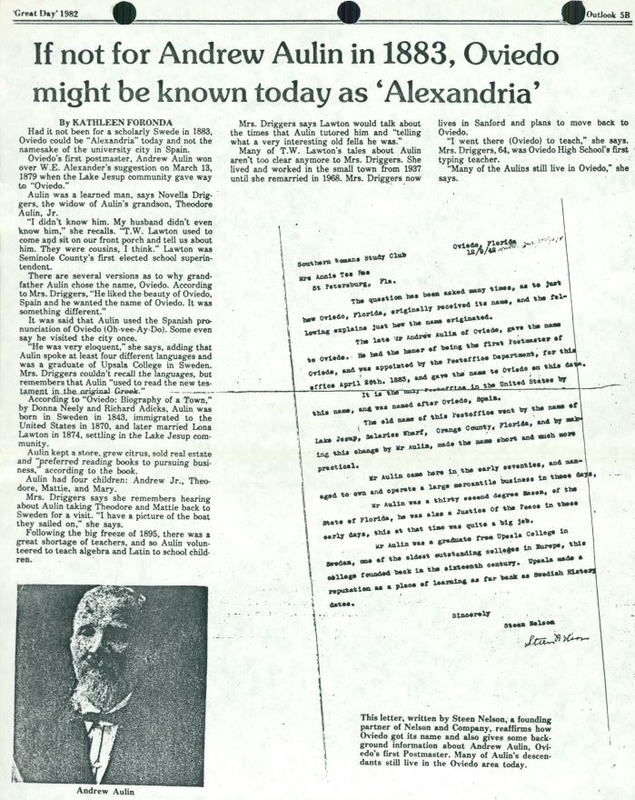 The article also includes information provided by Novella Driggers Aulin, the widow of Theodore Aulin, Jr., the grandson of Aulin. According to Novella, Aulin graduated from Upsala College in Sweden before emigrating to Florida in 1870. Aulin married Lona Lawton Aulin (1853-1907) in 1874 and together the couple settled in the Lake Jesup community (present-day Oviedo). Aulin was a storekeeper, citrus grower, and real estate salesman. He also taught algebra and Latin following the freeze of 1895. With his wife, Aulin had five children: Theodore Aulin (1874-1907), Willie Aulin, Martha Lenora Aulin (b. 1844), Mary Hannah Aulin (1887-1974), and Andrew Aulin, Jr. (1893-1964). Original newspaper article: Foronda, Kathleen. "If Not for Andrew Aulin in 1883, Oviedo Might Be Known Today as 'Alexandria'." The Oviedo Outlook, 1982: Private Collection of Kathryn Aulin Bunch. Digital reproduction of original newspaper article: Foronda, Kathleen. "If Not for Andrew Aulin in 1883, Oviedo Might Be Known Today as 'Alexandria'." The Oviedo Outlook, 1982. Originally created by Kathleen Foronda and published by The Oviedo Outlook. Foronda, Kathleen. “If Not for Andrew Aulin in 1883, Oviedo Might Be Known Today as 'Alexandria'.” RICHES of Central Florida accessed April 23, 2019, https://richesmi.cah.ucf.edu/omeka/items/show/6293.